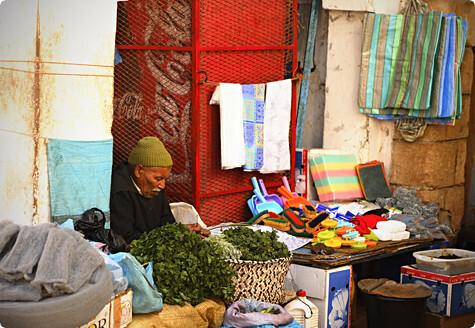 Read the first installment about our trip to Morocco here. 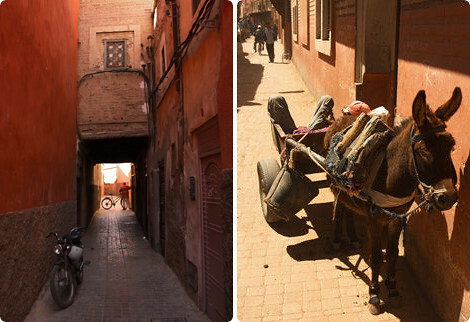 By the time we arrived at our riad, it was early evening in Marrakech and we were starving. We were desperate to drop our bags as quickly as possible and set out in search of dinner, but the riad manager, Omar, had other ideas. 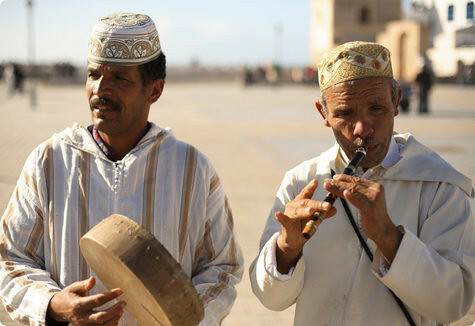 He assured us we couldn’t leave without first accepting some traditional Moroccan hospitality. 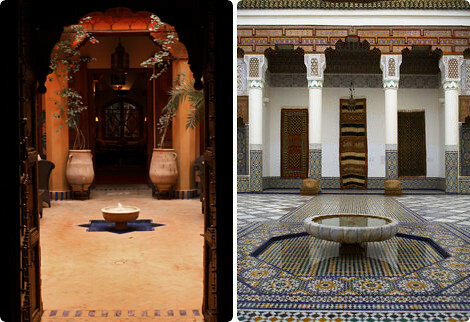 "Our custom in Morocco is to offer all guests a drink," he said, escorting us up to the riad’s expansive roof terrace, "and customary for all guests to accept it". "Alright," we acquiesced, certainly not keen to start our trip by contravening tradition even if we were on the verge of hunger collapse. "What do you have?" "Ah," he said with a mischevious smile, "some whiskey berbère, naturally." Not comprehending, we exchanged confused looks – hadn’t we just left the land of whiskey behind? Not to mention, wasn’t it awfully risqué to offer alcohol in a Muslim country, particularly with the mosque next door in plain sight? But before we could ponder the mystery further Omar was back, carrying a worn steel tray, two small glasses, and an ornate silver teapot. 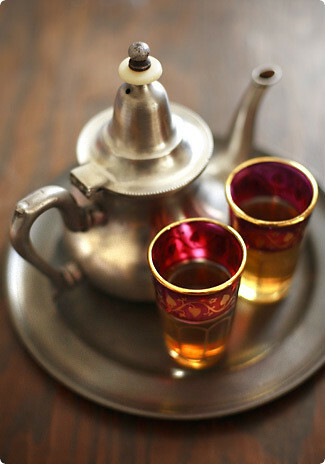 Of course, we should have guessed – whiskey berbère is nothing other than the tongue-in-cheek name for mint tea. The joke may have been casual, but the analogy isn’t actually so farfetched, as we would soon discover. Like whiskey in Scotland, mint tea isn’t a quaint tourist gimmick – it’s a national obsession. 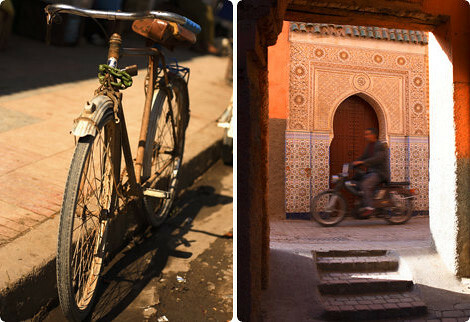 Hot, sweet, and bracingly bitter, it punctuates Moroccan life like clockwork: mint tea to wake up, mint tea with pastries in the afternoon, mint tea to round out every meal. It’s served with panache, poured from a great height out of bulbous silver pots into glasses barely bigger than thimbles; the aeration is important for developing the flavor, we were told, and the size of the glasses insures your tea will never get cold (and makes it easier to down the three obligatory cups that tradition dictates, I imagine). In a country where alcohol is forbidden and water is often of questionable quality, it’s a beverage that has acquired tremendous practical and symbolic value, functioning as digestive aid, pick-me-up, negotiation facilitator and simple sustenance. I wouldn’t be surprised if Moroccans have it running through their veins instead of blood. As we sat there in the growing twilight, sipping our tea and listening to the call to prayer reverberate across the rooftops, it seemed about as perfect a first taste of the country as we could have asked for. 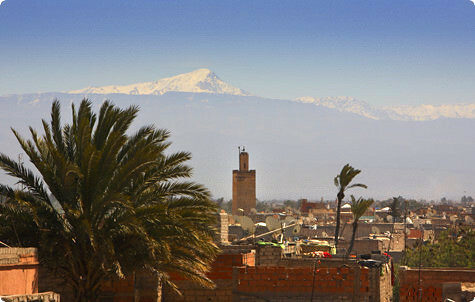 Unusually for us, we had arrived in Morocco without much of a food plan. That is, I knew plenty of dishes I wanted to seek out, but I hadn’t come equipped with a specific list of restaurants. We did have guidebooks, of course, and I had brought along a copy of Paula Wolfert’s Couscous and Other Good Food from Morocco for reference, but I was hoping that a combination of our own good instincts and some recommendations from locals would lead us to better food than too much advance planning would. 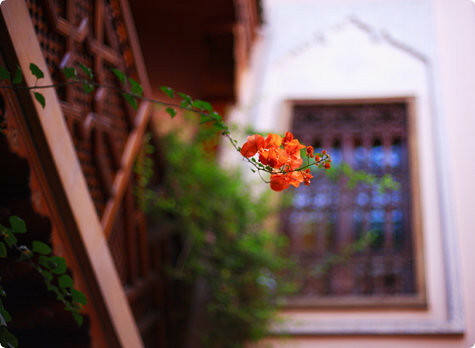 On that first night, as we set off from our riad in search of dinner, this strategy didn’t take long to pay off. Wandering the dark, twisting alleys of the medina, we found ourselves lured through the souks by the scent of fire and spice, and emerged right in the middle of one of the greatest food spectacles in the world: the food stalls in the Djemaa el Fna, Marrakech’s main square. The Djemaa el Fna is seething all day long, but at around six o’clock, just as the sun is fading, an army with a singular purpose descends on the western edge. 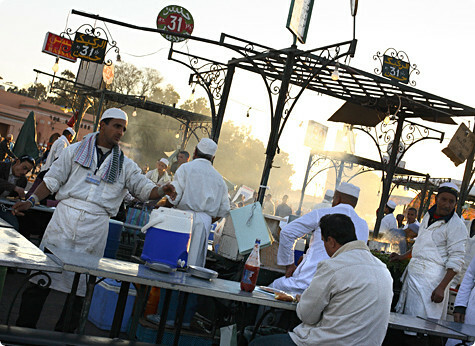 In a frantic burst of well-rehearsed clanging, carting and scurrying, over a hundred food stalls are set up with military efficiency; braziers and portable stoves are lit, massive cauldrons are heaved into place and filled with thick liquids, and long metal tables assembled for the throngs of hungry diners that will soon descend on the square. Once the cooking is underway, the real business starts: luring paying customers in. With so many stalls packed into such a small space, competition is fierce, and most food stalls seem to employ about a dozen people expert at shoving menus in your face and persuasively arguing the merits of their food. Although it pays to have a walk around before settling on one to dine at, in the end you’ll probably be perfectly happy wherever you end up – the food is fresh and cheap at all of them. There are different categories of stalls, however. 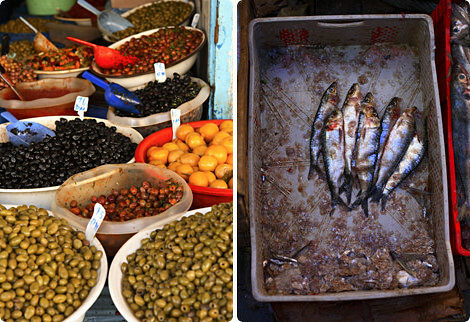 The ones most popular with tourists seem to be the stalls offering a little bit of everything: tagines, couscous, seafood, brochettes, vegetables, salads, bisteeya. 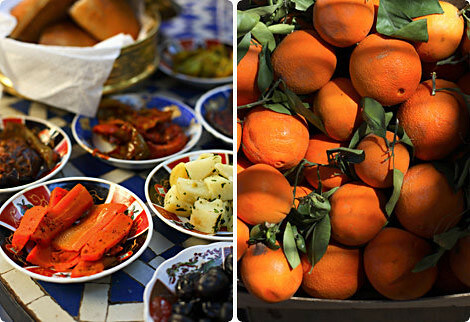 These are undoubtedly the best places to get an overview of Moroccan food and indulge your indecisiveness by trying a bit of everything (and at these prices – usually less than €10 a head – there’s no reason not to), but predictably, the quality of some things is higher than others. Another option is to patronize the specialized stalls, which do only one or two things, but do them very well and usually, even more cheaply. One night we limited ourselves to these, first squeezing ourselves in among locals to sample the excellent merguez (spicy lamb sausage) and butter-soft lamb’s liver at one stall, and then stopping off at another for a steaming bowl of harira (lentil and chickpea stew) with a side of dates – and paying less than five euros for the entire meal. Also seemingly popular in the single-offering department are the stalls offering boiled lamb’s head, with spoons provided to scrape out the jelly-soft brain, and the huge vats of spiced snails – both of which we gave a miss. In any case, while there may not be many culinary epiphanies to be had in food stalls like these, it’s hard to beat the selection, price, and sheer entertainment value. We found it hard to convince ourselves to go anywhere else for dinner. But it would have been silly not to, as restaurants are the better places (apart from private homes, of course) to appreciate the full complexity of Moroccan cuisine. What we quickly realized, however, is that while restaurants were all over the map in terms of price (a multicourse meal ranging anywhere from €5-75, depending on the establishment), the type and quality of food did not always vary in accordance. Instead, what you could be assured of getting the higher up the price ladder you climbed was an improvement in setting (the nicer restaurants looking more like sultans’ palaces than eating establishments), and an increase in quantity – not surprisingly, quite a mixed blessing. 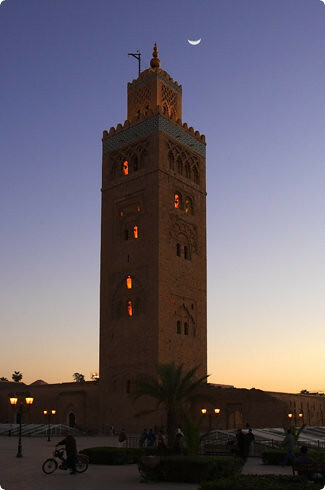 Due to their exclusively tourist clientele, many of the high-end restaurants in Marrakech only serve prix fixe, usually a multiple-course affair encompassing meze, bisteeya, mechoui lamb, couscous, tagine, fruit and pastries in generous quantities. 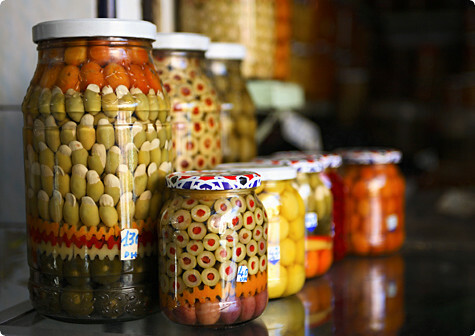 While the idea behind such bacchanalian excess is to give visitors a taste of Morocco’s famous too-much-is-never-enough hospitality, in reality this is something you probably won’t want to experience more than once, particularly as paying such a high price only to send mountains of food back to the kitchen loses its charm quickly. By contrast, many humbler places offered some of the best value for the most interesting fare. While we struggled to find a really good couscous, plenty of tagines found their way onto the ‘must recreate at home’ list. We experienced an exquisite tagine of meltingly-soft chicken with tomatoes, saffron and honey amidst the faded grandeur at Dar Mimoun (a dish which, coincidentally, I’ve already posted about – you can find my version of this dish here), a delicious marriage of beef and caramelized pears at Ferdaouss in Essaouira, and a simple yet perfectly balanced tagine of chicken, caramelized onions, raisins and almonds at the venerable Chez Chegrouni. We did have a few that unfortunately missed the mark, usually by virtue of being simply too sweet – a surprising twist as I thought no one liked sweet and savory as much as me. A definite menu highlight whenever we had it, however, was the spread of meze called simply salades marocaines – an array of cooked and raw salads covering the entire spectrum of color, temperature and spicing: fried eggplant and peppers, marinated carrots and potatoes, smoky grilled artichokes and zucchini, some enlivened with a pinch of cumin or ras-el-hanout (the ubiquitous sweet-hot Moroccan spice blend), others brightened with puckery slivers of preserved lemon or salty black olives. 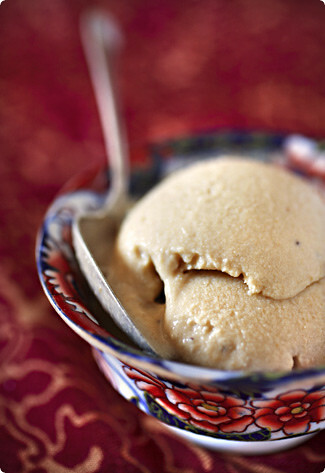 If Moroccan savory food is sweet, sweets are, well, even sweeter. Many tea salons offer you a selection of traditional Moroccan pastries to nibble on while you sip, but in the interest of comprehensive research, I went one step further and visited a patisserie where (much to the dismay of the shop assistant!) I asked for one of everything. In return I got a box stuffed with about forty pieces of pastry, including the famous almond-stuffed kaab el ghazal (gazelles’ horns), crumbly cookies called ghoriba, briouats (almond paste wrapped in layers of warka, a phyllo-like dough, and fried), and many types of baklava. My absolute favorite of these was something called shabbakia, coils of fried dough that have been dunked in a pot of boiling honey. Also called gâteau au miel, these crunchy, sticky delights are a traditional accompaniment to harira soup, and while the combination of spicy soup and sweet pastry may not sound particularly intuitive, this was one of the most delicious discoveries of our trip. 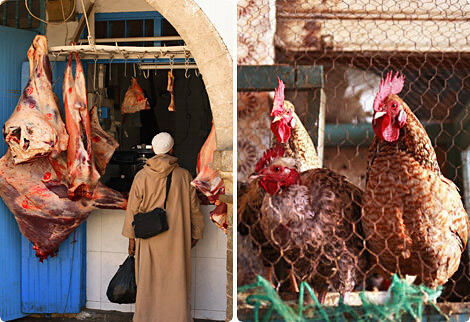 Butcher shops are a little different than their European or North American counterparts. 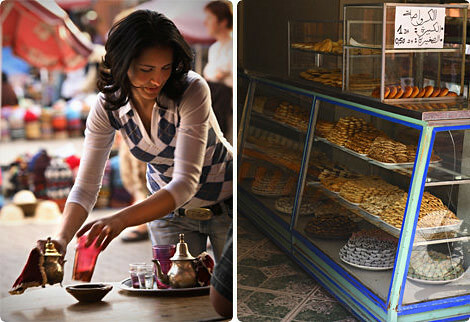 Of course, no account of eating in Morocco would be complete without a few words about bread. 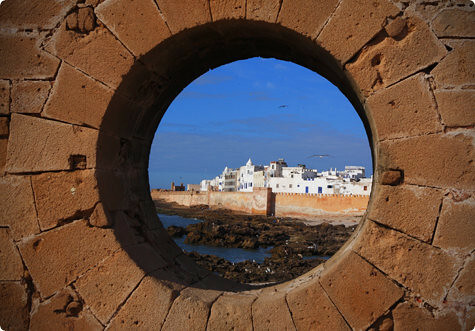 Like elsewhere around the Mediterannean, wheat is the primary starch in the North African diet, and bread has been made here since Roman times. 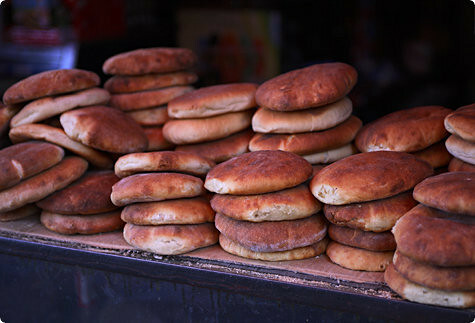 The typical Moroccan bread is a flattish disc ranging in diameter from six inches to well over a foot, leavened with yeast and often enriched with semolina, barley or whole wheat flours. It’s chewy, substantial and a necessary component to all meals, meant to fill the belly and act as a scooper and sponge (Moroccans eat with their fingers, after all) – and sometimes even plate. 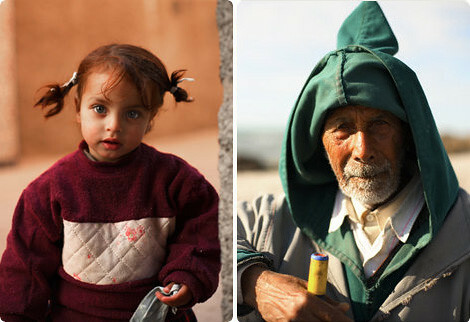 Moroccan families either bake their own, many still carrying the dough on flat trays to the nearest communal bakery, or they buy fresh bread from the stacks lining shop counters and filling carts along the roadside twice a day. At breakfast other types of bready things appear as well: beghrir, lacy pancakes cooked only on one side and eaten with plenty of butter and honey; small griddle breads not unlike English muffins called harcha, and flatbreads called rghaif that reminded me of something halfway between a crepe and an Indian paratha – slightly flaky inside, cooked on a griddle, and eaten hot with jam or honey. Baguettes are widely consumed too, as are other legacies of French occupation like croissants and brioche, but as is often the case, the local stuff just tasted much better – particularly when we were lucky enough to get one still warm and perfumed with the slightest hint of woodsmoke. Among the various things I brought home from Morocco – different types of olives, preserved lemons, a sticky box of shabbakia – the one I’m still carefully hoarding is the small bag I bought in the Marrakech souks the day before we left which contains a version of the spice blend ras-el-hanout. 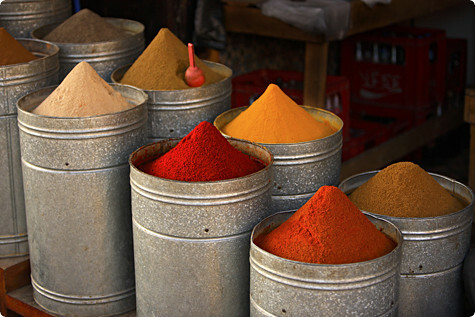 It was the best of the many blends I smelled, the one that instantly conjured up for me the mysterious and beguiling fragrance that spilled out of windows and doorways at mealtime and assaulted my nostrils whenever a lid was lifted from a tagine. It has hints of cinnamon, saffron, pepper, ginger, mint, coriander, garlic, rose – and a dozen more ingredients I can’t even begin to identify. and saturated the air around me. On our way to the airport to catch our flight home, our taxi driver recognized its scent, and turned to me with a grin: "you have discovered our secret." I laughed and responded, "it may be one of your secrets, but I’m sure it’s not the only one." His grin widened and he winked. "Next time you come you will learn the rest." 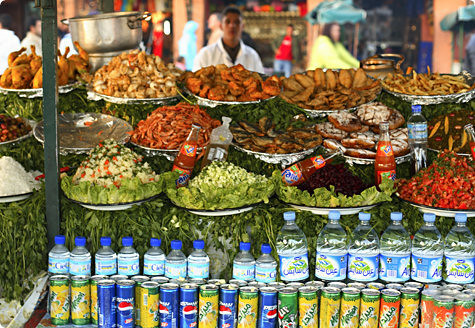 This is the classic, and certainly most comprehensive, book on Moroccan cuisine in English. Paula Wolfert lived in Morocco for years and collected recipes from home cooks throughout the country. Considerably more limited in scope than Wolfert’s book, Cooking at the Kasbah is nonetheless an excellent introduction to Moroccan food. I am a big fan of Kitty Morse’s recipes, which always work. While not limited to just Morocco, I do highly recommend this book if you’re looking for more a vegetarian interpretation of Moroccan food. Of all these, this is the book I’ve owned the longest, and its delicious, imaginative recipes are some of the most treasured in my collection (like this one). I was turned on to this book by the ever-inspiring Lindy, and have found it to be a wonderfully imaginative take on ‘new’ Moroccan cuisine. 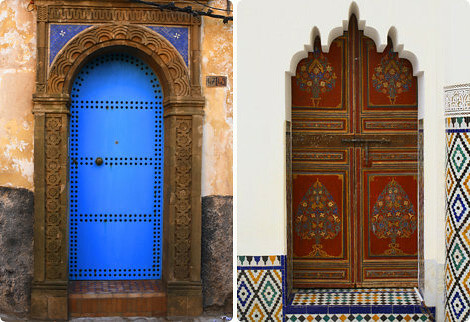 That is to say, traditional Moroccan methods and flavors combined in some untraditional ways, with spectacular results. This recent gem by Claudia Roden covers Morocco, Turkey and Lebanon, and contains recipes both traditional and modern, along with plenty of fascinating historical and cultural information. 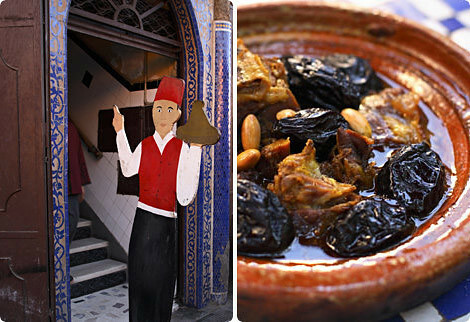 Cheap and cheerful eatery on the Djemaa serving excellent tagines. An ornate (and admittedly slightly gaudy) courtyard restaurant, serving good-value set menus, as well as à la carte. Don’t miss the Moroccan salads! Lovely tea salon/cafe, and a good place to grab a bite if you can’t face another tagine or couscous. Charming café overlooking the lively "souk des épices". 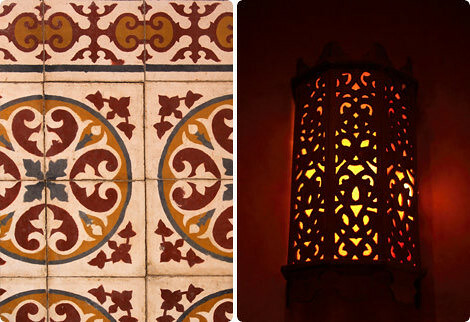 Delicious and imaginative Moroccan food, limited choices but very good quality and value. 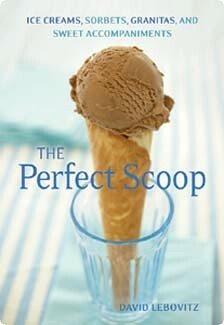 Excellent value with a choice of set menus all under 10 euros. Try the stalls at the port for lunch – they have a wide selection of incredibly fresh fish, which they grill to order and serve with salad – but memorize the price list posted at the entrance, and be prepared to bargain them down!